We've made some moves to get more physical on both fronts. Now it's time to Draft and develop. - DE Kony Ealy: 1 year 3 million with bonus incentives: Again, I preach rotational play can keep this line fresh and aggressive. Ealy would be in the mix and his contract at this time is not guranteed. - CB EJ Gaines: 2 years 8 million; only 3 million guranteed. This allows the Bucs to cut him next year if he cannot stay healthy. While talented, he has not been durable. - Safety Kenny Vaccaro: I know Dallas has showed interest, however why not come in and swoop him? Give him a Malcom Jenkins like deal when he needed a prove it contract with the Eagles. 1 year with a 2nd year option of more money. Draft: We need more draft picks. That is all I can say. Can we deal McCoy for a younger DT Talent in the draft? 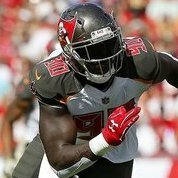 The last 3 signings allows the Bucs to go into the draft not needing to reach for anyone. Can take the BPA at 7 or move down a few spots. 1. Browns: Sam Darnold: unless they fall out of love with him, I think he's their guy at 1. I think they also like Josh Allen and they were planning on taking him at 4, but those plans have been scrapped with the Jets going to 3 to take one of the 3 top QBs. 2. Giants: Saquon Barkely : I understand the giants need a future QB. However they are also looking at Lamar Jackson and Mason Rudolph which shows they may want a guy to develop. Gettleman has history with Cam Newton and with Eli still at the helm, Barkely gives them a dynamic threat at RB to slow down the pass game and assist the defense and allow them to develop a Jackson or Rudolph in Round 2. 3. NY Jets: Josh Rosen : I think they like Josh Allen and he fits what they want to do. However, Rosen is NFL ready and can compete as soon as possible. The coaching staff is and front office need immediate results and Rosen fits the leadership role. 4. Cleveland: This has trade down opportunity written all over it. I believe Buffalo packages their 12th and 22nd pick with a 3rd and future 2nd to move up to 4. They take Josh Allen. Cleveland likes Allen, but signing a starting RB in Hyde means they aren't spending the top pick on Barkley and not knowing the Jets intentions, they take Darnold at 1. Buffalo gets the QB they want as Elway was going to take Allen at 5. 5. Denver: Denzel Ward CB Ohio State: Yes first shock of the draft. Chubb does not fit the defensive scheme and they just lost Talib. Everyone apparently is drooling for Ward and his shut down abilities. 6. Indianapolis: Quenton Nelson G Notre Dame: This will be frustrating. Because Colts can take Chubb or Nelson here. The colts have shown heavy interest in OL help this offseason so they may have tipped their hand a bit. They may have wanted Jenson to play Guard. Nelson has All pro written all over him. 7. Buccaneers select DE Bradley Chubb North Carolina State. - Buccaneers don't even hesitate to run the card to the podium. Bucs are in dire need of a pass rusher off the edge. The way the trades and Buffalos desperation for a franchise QB, this allows the Bucs to get lucky once again. Chubb is a top 3 talent. But scouts are throwing Denzel Ward into the mix of can't miss prospects along with Barkely, Chubb and Nelson. I can see Denver surprising all and taking Ward to replace the shut down CB they just traded away. Chubb immediately is a contributor to Ealy, Gholston, Spence and curry off the edge. - I think Guice should go end of the first round but I think there is a solid chance he falls due to the depth of the class once again. Physical 3 down back that the Bucs really can use. - Athletic punishing Guard that can solidify the interior line for years to come. - As we addressed edge rush and DT in FA and draft, Nelson adds much needed CB depth who can play inside and out. - This kid was a day two prospect before the knee injury. His upside when healthy is high. Adds receiving ability and a home run threat out of the backfield. Let's add more depth and competition to the interior. Pittman's strength and motor are coveted for depth at the next level. - Can play G or Tackle and adds depth to the OL. Post Draft: Bucs can now cut G JR Sweezy. Not a single complaint from me. Chubb falling to 7... must be a Buc fan! I’m not saying is will happen but I provided logic of how it could. Whos playing CB at Denver? Bills are definitely desperate to tryans move up for a franchise qb. Cleveland at 4 makes sense. Ward has a higher ranking in scouts minds as a top 7 pick. He’s being viewed as a shut down Cb. Nelson is considered a top tier talent. The colts can easily take Chubb or Nelson. They do have one edge rusher in sheard. The way they’ve acted in free agency, they are looking for help on the Oline desperately. I think it would take a miracle for Chubb to get past IND honestly, but I can't say it's not possible. There is always a surprise pick somewhere in the 1st round every year! What's not to like about this. Agree with the FA signing and love the draft. I'd think luck would have to be on our side for Chubb and/or Guice making it to our 1st and 2nd round picks. Yeah. I like Hernandez at Guard but I see him going in the top 25. Guice may not make it to us. Do we bank on Penny in round 2 or go with Freeman in round 3? That was my debate. I think there are gonna be a couple RBs who fall. Last year was supposed to be a great RB class too and there were only two taken in each of the first, second, and third rounds, if I remember correctly. I really like Royce Freeman out of Oregon. I think he’s got good vision and outside of Guice , Chubb and Barkely, he’s the 4th best three down back.